In three weeks the BNP will be contesting the parliamentary by-election in Corby & Northamptonshire. Whilst we don’t expect the BNP to come close to winning the seat Hope Not Hate want to make sure that the BNP get a clear and strong message that they aren’t welcome. Can you help send the message? On the weekend of the 3rd and 4th November, we will be leafleting in the constituency. 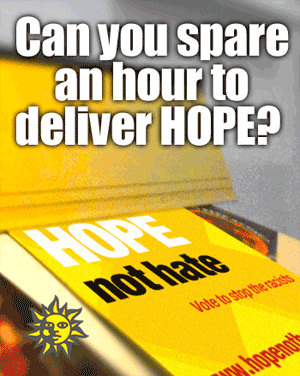 By donating just an hour to deliver 200 leaflets you can make sure that the BNP fail to gain ground in the East Midlands. Can you help us make sure Corby remains BNP free? Just a few hours of your time over the weekend, or an hour at another time, really could make a difference. We have a real chance to strike a blow to the BNP, and everything they stand for. Let’s make sure we take it! In the Mawdsley Room, Danesholme Community Centre, Boden Close off Copenhagen Road. Green Party prospective parliamentary candidate for Corby and East Northants Jonathan Hornett and Green Party leader Natalie Bennett will be attending. DPAC in Northampton getting residents to sign petition. The growing campaign against the Government’s controversial badger cull pilot was given a boost today as MPs got the go-ahead for a Parliamentary debate on the policy (1). The Government confirmed last July that it would introduce a major cull of British badgers in an attempt to control the spread of bovine TB in cattle – despite a weight of scientific evidence exposing the method as ineffective. Opposition to the plans has been fierce, with the RSPB, the Badger Trust, Animal Aid, Team Badger and others presenting strong evidence against a cull and putting forward alternative approaches to tackling bovine TB. An e-petition calling on ministers to stop the cull and implement a vaccination scheme has attracted over 100,000 signatures – leading to the Backbench Business Committee to green-light a House of Commons debate today. “(if the debate goes ahead) I am delighted that the voices of all those who signed the e-petition against this reckless badger cull will now be heard in Parliament when the debate takes place later this year. “In choosing to plough ahead with the barbaric cull in our countryside, the coalition government has shown complete contempt for scientific evidence on bovine TB. 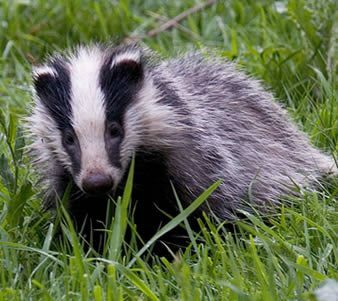 “A nine year randomised cull trial by the Independent Scientific Group on Cattle TB – costing £50m and destroying 10,000 badgers – concluded that ‘badger culling can make no meaningful contribution to cattle TB control in Britain’. “Even Lord Krebs, the Government adviser responsible for a 10-year experimental cull in the 1990s, has rejected the method – with his name appearing alongside more than 30 leading animal disease scientists warning against a cull in a letter to the Observer last week. “All this shows that we don’t need any more trials or pilots – the belief that badger culling represents an effective solution to the problem of TB in cattle has already been disproven. Will the Government Write a Blank Cheque for Nuclear Construction? The government’s plans for new nuclear power stations are on the rocks, and it would require desperate measures to save them. Some evidence of the desperation emerged when John Hayes, the recently appointed minister for energy said, in an interview with the Daily Telegraph, that he is ‘mulling over’ the possibility of underwriting plans for building new nuclear power stations. He appeared to be referring to the last remaining ‘live’ proposal by EDF’s for a 3.2 GW nuclear power plant at Hinkley C in Somerset. Mr Hayes would be well advised not to sip from the poisoned chalice (underwriting) he has been presented by nuclear supporters via the Daily Telegraph. Underwriting means telling EDF, in effect, that the government would foot whatever bill it took to build the power plant. Nobody knows for sure how much that would be given than similar plants still being built in Finland and France are now terribly over budget and a long time behind schedule. Underwriting would blast a hole through specific Conservative pre-election commitments not to underwrite nuclear power construction, not to mention Ed Davey’s pronouncements about there being ‘no blank cheque’ for nuclear. Underwriting would make a complete nonsense of any notion of nuclear power being competitive with renewable energy sources such as wind power and solar power which certainly are not in receipt of ‘underwriting’ commitments. The energy consumer would be funding such a blank cheque, this would effectively mean that nuclear power costs were being nationalized and billions of pounds handed over to a multinational company in an unlimited commitment. Despite the long history of the financial uncompetitiveness of nuclear power we still see assertions by the engineering establishment that it is cheap, cheaper than renewables, and so on. This is always based on the notion that the next design will be much cheaper than the last one. It never is – on the contrary, the trend in costs seems to be upwards. Banks refuse to invest in new nuclear power stations without the loans being underwritten. In theory, EDF can borrow money off the markets to fund Hinkley C. The problem is that EDF shareholders would take the risk of falls in dividends and share prices. Credit ratings agencies will not be amused if EDF’s debt-to-earnings ratios rise and seem imperiled by highly uncertain nuclear investments in the liberalized British electricity market. Although, in the past, the costs of nuclear power stations have been sunk in the accounts of nationalized industries and the consumers made to pay the costs through being beholden to monopoly suppliers, this time the cost comparison with other options seems painfully clear. Nuclear is more expensive than renewables – now – never mind in the future as renewable costs decline. The government, in their Electricity Market Reform, have set up what is in effect a competition to deliver low carbon sources at the cheapest ‘strike price’ – that is a price that the electricity consumer would pay for each unit of ‘low carbon’ electricity generated. The trouble for nuclear power is that when it comes to the crunch they need rather higher amounts set as a strike price than what the government is willing to set to pay for onshore wind power and even allegedly expensive offshore wind power and solar power. Anti-windfarm groups are fond of attacking the subsidies going to onshore wind, but the price needed to be given to onshore wind developers will be much, much, less than what would have to be paid to EDF for new nuclear power. Public support for paying more to nuclear than renewables for producing a given amount of electricity is likely be very low indeed. So, nuclear supporters are hoping for a fix that avoids the spectacle of being declared too expensive. That is where underwriting comes in. But, politically, (as well as cost-wise for the consumer) that sinks like a lead balloon, no matter how the brilliant nuclear PR spinners want to pitch such a proposition. It is not as if the UK needs any new nuclear power stations to supply electricity, for which demand has fallen by 8% since 2008. This is regardless of whether you look at a conventional picture of the fact that gas power stations can be built much quicker than nuclear ones or, preferably, at green ones where renewables, smart grids, energy efficiency and other techniques contribute towards decarbonisation of the economy. What is my bet on what happens? Well, the government could take the easier option, which is simply to blame EDF for not coming up with the goods. In return, EDF could blame the government for not offering them enough ‘certainty’ on future electricity payments. Regrettably, meanwhile attention has been drawn away from the lack of support proposed for renewable energy. The terrible irony of the government’s proposals is that the renewable energy support mechanisms proposed in the Energy Bill have been hamstrung by the political drive to give priority to a nuclear power building programme that may never actually materialize. Dr Toke is the author of a report Fixing Renewables, a new report published by Friends of the Earth and he is also Senior Lecturer in Energy Policy at the University of Birmingham. He is also a member of the Green Party of England and Wales. By refusing to place an outright ban on the use of the deadly poison carbofuran, the Wildlife Minister Richard Benyon is not only cosily sidling up to his friends on Britain’s shooting estates, but he is also attempting to sidestep an important piece of EU legislation put in place to protect our majestic and beautiful birds of prey. Under the EU Birds Directive, the UK Government is legally obliged to take the necessary steps to protect all bird species living naturally in the wild. This vital piece of legislation also makes it a crime to deliberately kill or capture the bird species covered by the Directive, which in the UK’s case, includes the Golden Eagle, the White-tailed Eagle and the Buzzard. Since 2002, over 200 birds of these species have been callously poisoned by carbofuran with scant regard paid to protective measures laid out in the Directive. By burying his head in the sand over the carbofuran on game estates across the UK, the Minister is at best guilty of pandering to the interests of the shooting lobby and at worst of turning a blind eye to these widespread and devastating instances of wildlife crime. Jonathan Hornett, who lives in Wellingborough and runs his own gardening company, has been selected to fight the seat for the Green Party. Mr Hornett said: “I’m standing to give the people of Corby and East Northamptonshire the opportunity to choose a positive candidate. “The Green Party is the only alternative to cuts, climate change and social injustice. You are currently browsing the The Northants Green Party Blog blog archives for October, 2012.